The larger plot will see you growing and harvesting globe artichokes, spinach, turnips, cabbages and cauliflowers, onion sets and peas - the latter sown at three week intervals through until June. Now you can sow winter greens, Brussels sprouts, broccoli and dig trenches in preparation for marrow, tomatoes and cucumbers. Those second early potatoes you have chitted can go into the ground in the first half of the month and maincrop in the second half. Asparagus beds can be prepared and crowns planted. 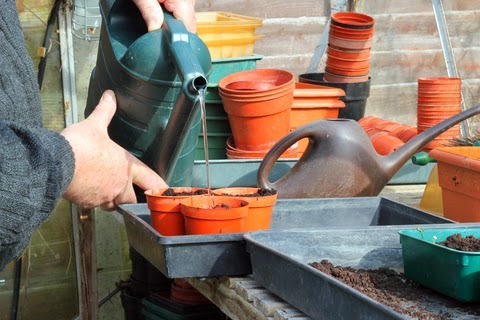 If you’re in a mild area, sow sweet corn and dwarf French beans under fleece or cloches at the end of the month or, if the weather is cool, wait until May. Indoors, sow seeds of courgettes, squash, aubergines, celery, celeriac, pumpkins, marrows, sweet peppers, tomatoes and salads.